A potent immune tonic in traditional chinese medicine. Astragalus membranaceus, the active ingredient in Provita Nutrition & Health Astragalus 9000, is primarily used in western medicine to strengthen the immune system function. In Traditional Chinese Medicine, it is used in treating influenza and for augmenting the qi (vital energy). Astragalus is also an antioxidant and has been shown to promote cell proliferation and survival. It inhibits free radical production, increases superoxide dismutase (SOD) and decreases lipid peroxidation. Astragalus is also called an adaptogen, meaning it helps protect the body from physical, mental, or emotional stress. It is thought to improve the immune response by potentiating the effects of interferon and it has been confirmed to enhance the immune system in vitro and in vivo investigations. 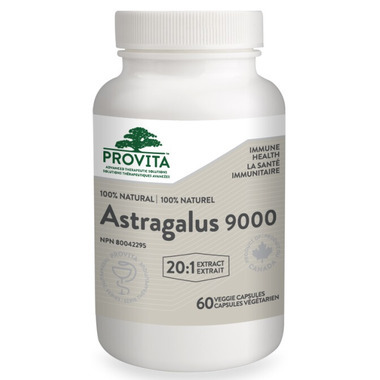 Provita Nutrition & Health Astragalus 9000 provides a concentrated 20:1 extract from the root of Astragalus membranaceus, being one of the most potent products in its class. Used in Western herbal medicine to maintain a healthy immune system. Traditionally used in Traditional Chinese Medicine (TCM) to tonify the spleen and augment the qi (vital energy). Non-Active Ingredients: Microcrystalline cellulose, Magnesium stearate (vegetarian source), Hypromellose. Does not Contain: Dairy, egg, gluten, soy, wheat, corn, yeast, nuts, artificial sweeteners, colours or flavours. Dosage: Adults take 1 capsule 3 times per day. Caution: Consult a healthcare practitioner prior to use, if you are pregnant or breastfeeding or if you have an auto-immune disorder. Hypersensitivity (e.g. allergy) has been known to occur; in which case discontinue use. Do not use in cases of exterior excess, Qi stagnation, damp obstruction, food stagnation, Yin deficiency with heath signs, or skin lesions in their early stages or where there is a heat toxin. Do not use if seal is broken. Keep out of reach of children. Keep sealed, store in a cool, dry place at 15–25ºC.